What’s that you’ve brought me? 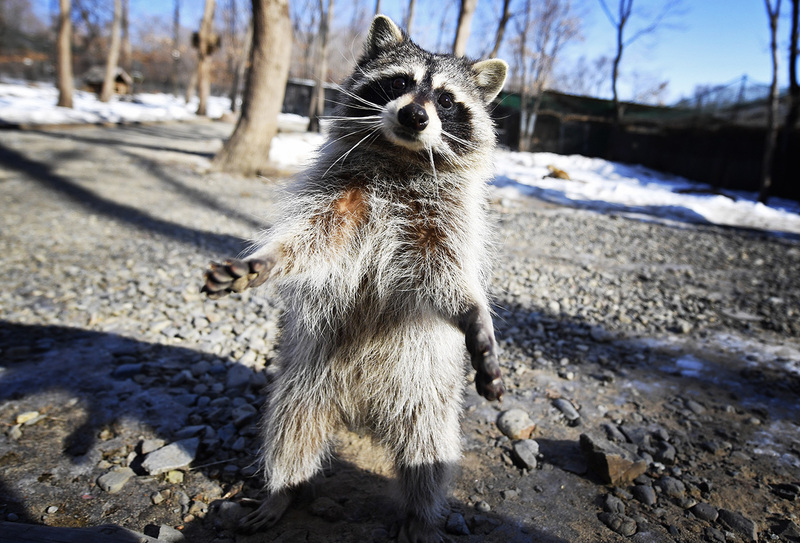 A raccoon at Primorsky Safari Park in the village of Shkotovo. Known for an unusual amity between a tiger and a goat, the park turns ten. For many years now, the most popular place for a family holiday in the Primorsky Territory has been the safari park near the village of Shkotovo (4,000 miles east of Moscow, 55 miles from Vladivostok). The famous nature reserve celebrated its tenth anniversary on Feb. 7. Primorsky Safari Park is an enclosure inside the Ussuri taiga forest. Visitors can observe the wild inhabitants without fences or screens in conditions as natural as can be. Injured animals are nursed back to health by staff. The park has a high turnover rate: once fully recuperated, animals are released back into the wild, and their place is taken by others. The park became famous for two local “residents”: Amur the tiger and Timur the goat. The story of their unusual friendship began in November 2015, when the cloven-hoofed one had a “dinner date” with the predator. However, Timur didn’t take kindly to being on the menu and managed to keep Amur at hoof’s length, after which they began spending time together. In late January 2016 the friends had a slight altercation, resulting in Timur being mauled for his shameless behavior. After rehabilitation, Timur was resettled. In March 2016 he received a mail-order bride all the way from Moscow — a nanny goat by the name of Merkel (no relation of the German chancellor, we presume). On January 25 Timur became the happy father of a kid, quite literally. The young tigress Ussuri, born June 3, 2014, at the Moscow Zoo nursery, was brought to Primorsky Safari Park on October 17, 2015, as a partner for Amur. On September 18, 2016, she gave birth to a cub called Shere Khan. The park is home to 15 species of birds of prey: hawks, owls, black kites, tawny owls, eagle owls, to name a few. A guided tour with a professional ornithologist gets you closer to the action. Some birds will even perch on your arm. The safari park also houses foxes, badgers, minks, wolves and Amur leopards. The different species get along well. The ungulates have an enclosed forest area of around five hectares all to themselves. Three parks in total: one winter, two summer. The animals move from park to park to give the plants time to grow. Five species of wild ungulates from the Primorsky Territory are free to roam this area, along with waterfowl and tame rabbits. The park for ungulates now contains Manchurian wapiti, sika deer, roe deer and wild boars. The tame animals are quite happy to approach people. It’s even possible to hand-feed and stroke them, and have your picture taken together. Dholes, or red wolves, are the rarest of animals. Once native to the Primorsky Territory, now they have all but disappeared. The last sighting of this rare species in the Primorsky Territory was back in 1973. In his Mowgli stories, Kipling described the dholes as an all-destroying, fearsome avalanche attacking the jungle. Dholes do indeed live in packs, but not as large as the fictional ones. Primorsky Safari Park currently counts three dholes in residence. Along the perimeter of the leopard enclosure runs a six-meter high bridge offering views of leopards in their natural habitat — with no wire fencing in front of the eyes. It is currently home to one leopard, who will soon be joined by a female of the species.